Key Stakeholders of the Waterwise Development Exemplar. From left: Greg Claydon (Executive Director Science and Planning: Department of Water and Environmental Regulation), Steve Capewell (General Manager and Non-Executive Director: Water Corporation), Greg Ryan (Sustainability Manager: LandCorp), Dr Brad Pettitt (Mayor: City of Fremantle), Dr Josh Byrne (Director: JBA & Research Fellow : Curtin University and CRC for Low Carbon Living). WGV at White Gum Valley has won the 2017 WA Water Sensitive Urban Design (Graham Heal) award at the Australian Water Association (AWA) WA 45th Anniversary & Water Awards Dinner. 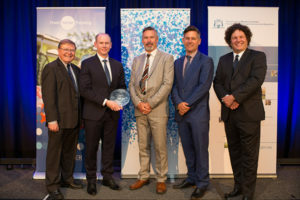 The award recognises ‘excellence in total water cycle management resulting in better on–ground water, wastewater or drainage outcomes’, highlighting Josh Byrne & Associates’ (JBA) industry leading approach to urban water management and scheme water optimisation at WGV. WGV is a 2.2ha LandCorp ‘innovation through demonstration’ residential infill development in the Fremantle suburb of White Gum Valley showcasing precinct-scale design excellence on many levels. The project is targeting a 60% reduction in mains water use across the various housing typologies and has been endorsed by the Water Corporation Waterwise Development program. Key water saving initiatives include a community bore irrigation supply for use in both public and private gardens, as well as lot-scale rainwater harvesting systems for toilets and washing machines. There are advanced water efficiency measures in the homes and a range of water sensitive landscaping features integrated across the development site. Smart metering of all water sources provides real-time data that will assist householders to better manage their water use and validate performance modelling assumptions used during the design of the project. The push for setting mains water efficiency targets beyond those considered industry best practice has been led by JBA in partnership with key stakeholders including; Water Corporation, LandCorp, Department of Water and Environmental Regulation (DWER), City of Fremantle, CRC for Water Sensitive Cities (WSC), CRC for Low Carbon Living (LCL), Curtin University Sustainability Policy Institute (CUSP), UDIA and JBA. The project learnings are being shared with the wider industry through events, tours and technical publications communicated via the innovative WGV Waterwise Development Exemplar communication program. Further detail about the project can be found in the Case Study developed by the CRC for WSC. WGV is also the subject of Density by Design, a factual web series produced by VAM Media as part of the broader research project on low-carbon residential precincts being undertaken by Curtin University for the CRC for LCL. Follow the links to JBA’s web page on Urban Water Management or search JBA’s Water Sensitive Design projects for more information about our award-winning services.